It's around 150-100 BC, and you (being the ancient Greek that you are) decide to spend the weekend calculating astronomical positions. What do you use? 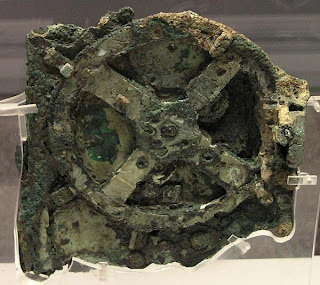 The only mechanical computer around: the Antikythera Mechanism. Fast forward to the early 20th century, where divers discovered over 30 gears from clock-like mechanism in a bronze case off the Greek Island of Antikythera, between Kythera and Crete. Ever since, scientists have been struggling to figure out how it actually works. Physicist Mike Edmunds and mathematician Tony Freeth, along with a team of researchers believe they've finally solved the mystery. New findings from their study suggest that Greek technology was far more intricate and complex that previously thought. In other words, the Greeks dominated astronomy for a thousand years with this carefully crafted, almost perfect device. After exhaustive work on the gears, the team was able to show that the mechanism could track astronomical movements with impressive precision, including monitoring the movements of the moon and the sun through the Zodiac. It could even predict eclipses and recreate the irregular orbit of the moon. As if that isn't enough, the calculator may have also predicted the positions of the planets. Using powerful X-ray and imaging technology, researchers were able to examine the machine's fragments and hone in on fine surface details. But exactly what the ancient Greeks used Publish Postthe Antikythera mechanism for remains unknown, and next scientists aim to create a computer model and eventually a full replica of the machine, in the hopes of answering many lingering questions.